Note: Reformulated blendstock for oxygenate blending (RBOB) is unfinished gasoline. Flattening year-over-year growth in gasoline demand in the United States, combined with high levels of refinery output, have contributed to low or negative motor gasoline refining margins for refiners along the East and Gulf Coasts. Gasoline refining margins—the difference between the spot price of gasoline and the Brent crude oil spot price—have been on a downward trend since August, and these margins have been at some of their lowest October and November levels in the past five years. At the same time, strong growth in distillate demand has driven increased distillate prices and refining margins. This combination of low gasoline and high distillate refining margins may signal a shift by refiners to maximize diesel fuel production instead of gasoline production. The crack spreads in the Amsterdam-Rotterdam-Antwerp (ARA) region of Europe and in Singapore, two global refining and distribution hubs, suggest markets in these regions are experiencing similar trends. Crude oil processed through a U.S. refinery typically yields about twice as much motor gasoline as distillate fuels. As a result, although gasoline margins have been low recently, refiners cannot completely stop making gasoline in favor of other petroleum products, such as distillate. High refinery runs (driven by increased distillate demand) combined with lower demand for gasoline contributes to the high gasoline inventory levels, which have been higher than their recent five-year range since mid-August. Higher gasoline prices in 2018 have contributed to flattening U.S. gasoline demand growth. Combined with increased levels of refinery output driven by strong demand for diesel fuel, gasoline production has outpaced demand, and inventories have increased beyond their normal seasonal levels, lowering gasoline prices and, as a result, gasoline margins. 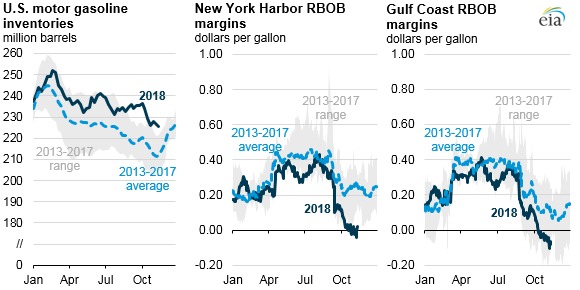 Motor gasoline margins based on wholesale gasoline prices at New York Harbor averaged 26 cents per gallon (gal) in the first half of 2018, but these margins fell to an average of 4 cents/gal in October 2018 and have been negative so far in November. Changes in margins in the Gulf Coast were similar, falling from 27 cents/gal in the first half of the year to 1 cent/gal in October and falling further to negative values during November. 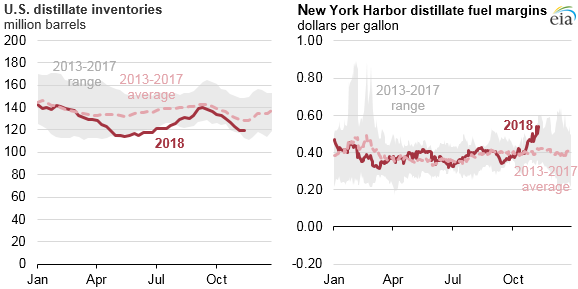 By comparison, New York Harbor ultra-low sulfur diesel margins averaged 38 cents/gal in the first half of 2018 and increased to 40 cents/gal in October and to more than 50 cents/gal in November. Through the first three weeks of November, estimated monthly gasoline consumption (which EIA measures by proxy as product supplied) averaged 9.2 million barrels per day (b/d), a decrease of 262,000 b/d from November 2017. Conversely, U.S. distillate fuel oil product supplied increased 216,000 b/d through the first three weeks of November, largely because of economic activity and increased freight and trucking activity. High levels of U.S. gasoline production in 2018 have outpaced gasoline consumption growth in 2018, leading to average inventories in November that are 14.8 million barrels higher than at the same time in 2017. Conversely, inventories of distillate have fallen in November and are 5.8 million barrels lower than at the same time in 2017. In its latest Short-Term Energy Outlook, EIA expects that gasoline refining margins will remain low during the winter before rebounding and following their normal seasonal patterns heading into the 2019 summer driving season. U.S. gasoline refining margins are forecast to average 13 cents/gal in the fourth quarter of 2018, compared with 29 cents/gal in the fourth quarter of last year. Gasoline margins are expected to increase to about 36 cents/gal in the second and third quarters of 2019, similar to their levels in 2018. Comparatively, EIA expects diesel fuel margins to remain high, averaging 46 cents/gal in the fourth quarter of 2018 before gradually increasing to an average of 53 cents/gal by the fourth quarter of 2019.